Ferrari introduced a new configuration of exhaust and wastegate pipes. Previously, the wategates which enable the turbocharger to release unnecessary flows sat on both sides of the single exhaust pipe. On the new configuration, the two thin wastegate pipes are places directly on top of the main exhaust. In addition to this change, Ferrari also popped up with a new rear wing design which features an upwardly curved leading edge to the mainplane. The Italian team could incorporate its unique exhaust solution thanks to its twin-pillar design for its rear wing which help in directing the various flows. The changes clearly pose the recent attempt that Ferrari are adamant to try to use the energy of the gases coming out of wastegates and main exhaust pipe. FIA has been long hunting the solutions which seize on the aerodynamic benefits of these gases. Renault raised eyebrows with its remarkably high exhaust pipe at the start of the year. All these attempts show that teams will seize on every opportunity which they can benefit from as the blown effect is still relatively significant despite to the governing body’s harsh clampdown on the design of exhaust configuration. On Friday, it was Sebastian Vettel who took the exhaust configuration to the track while Kimi Räikkönen was running with the old solution. Ferrari then abandoned the trials with the unique positioning of the pipes, but they are expected to reuse it after some refinements. Sauber is seemingly not easing off with its development push it started a few race weekends before. The Swiss team was strengthened by former Ferrari design chief Simone di Resta who makes his official debut for Sauber at the weekend. The Hinwill-based squad were trialling a series of alterations during Friday practice sessions. The modifications included changes to the sidepod area. The shape of the lower inlet was revised and the the upper one was brought forward. To move the airflow around the revised sidepods in the most effective way, the team also added three new fins. Red Bull introduced a new floor in Hockenheim. The new solution features two fully-enclosed holes which run parallel to the floor’s edge. Both elongated holes meet and merge with the the first angled hole which sits ahead of the rear wheel. This set of holes is very much reminiscent of Ferrari’s floor introduced at the previous round in Silverstone. Renault debuted a new front wing which sports shorter inboards sections. 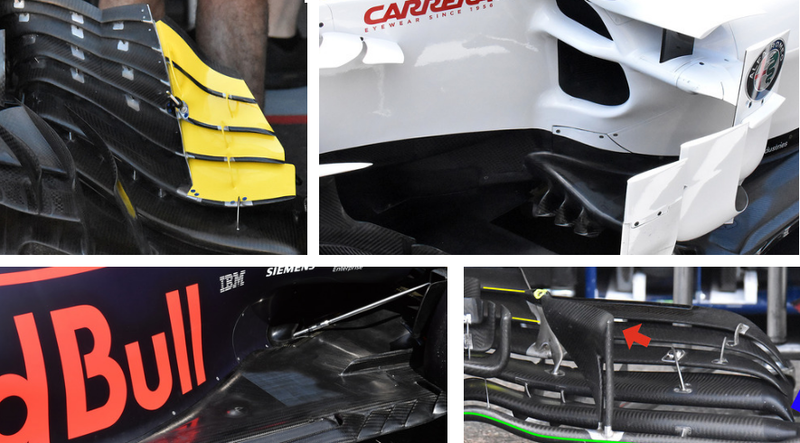 It means that the adjustable part of the front wing flaps is much shorter. The French manufacturer wants to improve the balance of their car in the medium- and high-speed turns. In a bid to cure its aerodynamic issues, Williams appeared in Germany with a heavily-upgraded front wing design. Tnew new solution features a more curved R-shaped cascade wing, higher connection point between the flap and the neutral section and a less curved trailing edge of the main plane. The visually biggest change is that the tunnel section at the outer part of the wing is much less articulated.